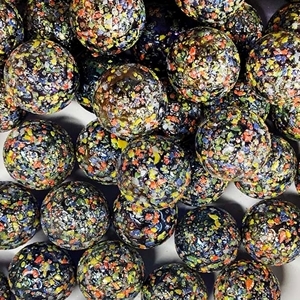 These Glitterbomb boulder marbles have an opaque black base and flecks of color on the outside including red, yellow, green, and blue. They have a very textured surface. They are also iridized to have a highly reflective shiny surface. They are approximately 1" in diameter. These boulders are sold in packs of 12 or 125. Sizes may vary slightly. Warning! : Choking Hazard. This toy is a marble. Not recommended for children under 5 years.